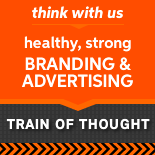 The new Train of Thought website has finally launched. This is a quick reminder to not put off until tomorrow what your marketing needs today. A client (accidentally) told me one day that they didn’t know the breadth of our services or the depth of our people. It wasn’t their fault. It was mine. I let my marketing guns down by not promoting and educating, while focusing on the work at hand. Their accidental admission was my wake-up call. I had put our new Train of Thought site development on hold several times. Big mistake. I’ve always told clients if you stop marketing, your business will absolutely drop off. And it’s true. Even if you are so busy you can’t imagine bringing on another client, you must continue marketing, even if only a little bit. You have to keeping educating the clients you have, and continue reaching those you hope to one day land. That one interaction lit a fire under my tail. After all, we began the project in May, 2010! 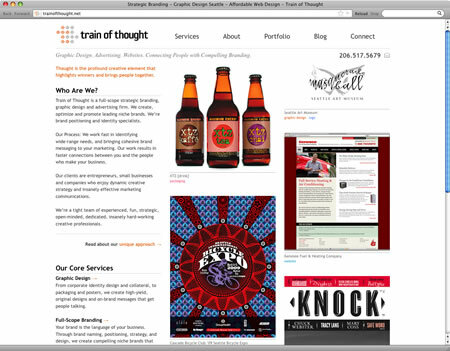 I’m stoked to announce the new Train of Thought site has finally launched. Is it everything we’d hoped? Resoundingly, yes. This is the first site we’ve had that accurately describes who we are, what we do, the depth and breadth of our work, speaks in the tone we actually use (minus any occasional expletives), and shows large work samples complete with strategy or background details. In short, it’s completely true to our brand. As a person who is usually looking for a better way, I’m pleased to say I am completely happy with the site. You can read about our goals and accomplishments with it here. I hope you will poke around, read the branding blog, check out our portfolio, and generally find the site useful.